The following article is heavily indebted to Christopher Browning's magisterial study of the German Foreign Office, the Auswärtiges Amt (hereafter AA). Browning's study focusses on the knowledge and activities of the officials of Referat D III, headed by Rademacher, which was part of Abteilung Deutschland, headed by Luther. These men were ultimately responsible to Ribbentrop but tended also to act on their own initiative, often in collusion with the SS. This dual nature gave those men unique insight into the extermination of Jews as it unfolded in various stages, first in Transnistria, the USSR, Croatia and Serbia, but then from mid-1942 in the attempts of the Germans to secure deportations of Jews from ambivalent partner states such as Italy, Romania and Hungary. Browning's study remains the most important analysis we have of what these men knew and when they discovered it. Their acquisition of knowledge from September to November 1941 can be divided into five components. Firstly, they gained knowledge in September of a willingness by Heydrich's RSHA and the military authorities to shoot 8,000 male Jews in Serbia, as I discussed here. Secondly, they received reports of Einsatzgruppen shootings in the USSR. Luther and Rademacher received and initialed copies of the first five Activity and Situation Reports on November 17 and 18 respectively and on November 19, Rademacher excerpted three paragraphs from the first report and sent the excerpts to Jagow (Browning, p.73). Moreover, back on September 5th, Luther's rival Weizsäcker had been informed that "we don’t treat the Jews with kid gloves and that in the east already many a Jew no longer lives" (quoted by Browning here). Moreover, some knowledge of mass killing existed two months earlier because on September 1st, Killinger informed Luther that 4,000 Jews had been killed in Jassy (Iasi) and that the Romanians were carrying out "unheard-of persecution" (Browning, p.54, citing NG-4962; also in Hilberg and Gilbert). The stronger the German victory looms, the greater and more urgent becomes the tasks of the Referat, because the Jewish question must be solved in the course of the war, for only so can it be solved without a world-wide outcry (Browning, p.83, citing PA, Inland II 347/3, Rademacher to Schroeder, 24.3.42). 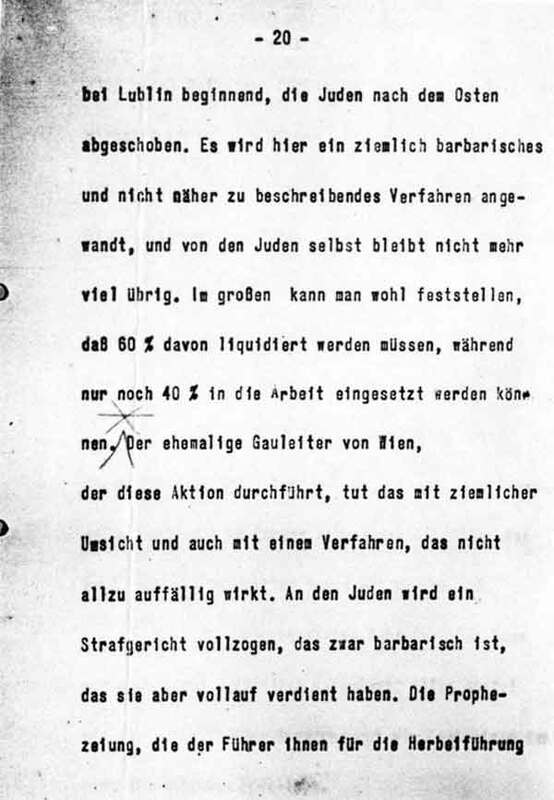 Back in October, Luther had understood from Heydrich that planning consisted of "measures for a basic solution to the Jewish question to be enacted after the war"; by the last 10 days of March 1942, it was understood by both Rademacher and Goebbels that it had to be enacted before war's end, along the parameters laid out at Wannsee.